SEO basics: What are long tail keywords? “If you want your posts to rank, you should write about long tail keywords”. You’ve probably seen this common SEO advice before. But what do we mean by long tail keywords? And why should you write about them? Here, we’ll explain what long tail keywords are and how they can help you rank. Including examples! In SEO, we distinguish between head keywords and long tail keywords. A long tail keyword is more specific than a head keyword, and most of the times – but not necessarily – it consists of more words. The head keyword is a general term lots of people write about. A long tail keyword is a more specific topic or a subtopic of the head term. Usually, less people create content about this topic. How do they help you rank? The idea is quite simple. As mentioned above, there is less content on the web about long tail keywords, because less people have written about them. Less content means less competition! Because the competition isn’t that fierce, it’s easier to beat other web pages with content about long tail keywords in search engines. In addition, you might find that it’s easier to target a specific search intent with long tail keywords. Search intent is the why behind a search: does someone just want information or is he/she looking to buy something? Or something else entirely? Let’s look at an example. An example of a head keyword or keyphrase is [educational books for children]. There are many booksellers, publishers and bloggers writing about educational books. If you just start out with your website, it’d be virtually impossible to rank for this term. You’d have to compete with Amazon, Barnes and Nobles and the likes. What you should try is focusing on a niche for your blog or your shop. Finding a niche means targeting a very specific group of people. You can do so by creating very specific content: content about long tail keywords! An examples of a long tail keyword could be: [educational books for autistic teenagers]. If you write high quality content about a specialized topic like that, you can beat the competition for those long tail terms. Also, if you are targeting searchers who have an intent to buy books, you can include that term and focus your content on answering this search — maybe throw in a local search as well: [where to buy educational books for autistic teenagers in Vancouver]. You might think: “But I want to rank for the head keyword. That one gets loads of traffic!” It does, but if you rank page 10 for that query, you won’t get much out of it. It might drive a lot of traffic, but nothing that’ll convert to sales or inquiries. So we’d advise to start with the less competitive, long tail keywords. When you’ve written several articles about related long tail keywords and you rank for those, you can aim for a term that gets closer to the head term. Let’s go back to the example of [educational books for autistic teenagers]. You could write about [educational books for autistic preschoolers], [picture books for autistic children] and [reading stories to your autistic child] too. This way Google will find out you have quite a bit of specialized content on this topic. If you bundle all this knowledge in one cornerstone article, for instance, [educational books for autistic children] and you make sure you link from all your long tail articles to this main article, you’ll increase your chance of ranking for the main article. If this works, you can start writing high quality content about other types of educational books for children. Slowly but surely, you’ll be getting closer to the head terms. We call this a cornerstone content strategy. Less competition isn’t the only advantage of writing about long tail keywords. If you focus on a niche, your visitors will more easily convert into customers, newsletter subscribers or whatever you’re aiming for — especially if you cater to their search intent. Let’s say your visitors are looking for a very specific type of book. If they land on your site, specialized in exactly those kind of books, they’ll likely find and buy the books they’re looking for. Just another reason to focus on the long tail! 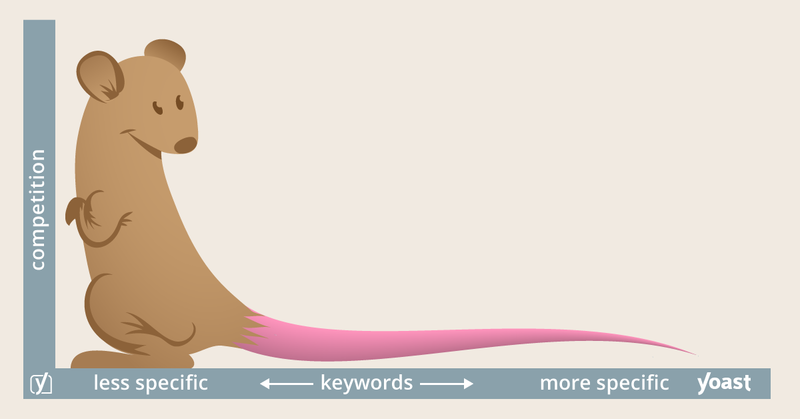 The post SEO basics: What are long tail keywords? appeared first on Yoast.